You had to see this coming – Victory Poker Closes Up Shop. All Victory Poker players found an e-mail on May 31st announcing that their accounts would be turned into Cake Poker accounts on June 1, and all your funds, Gold Cards and Gold Chips and tournament tickets will be transferred to your Cake player account. Dan Fleyshman the CEO of Victory Poker is ending his dream of Victory Poker. He voluntarily left the US market right after the Poker Black Friday, by instructing the Cake Network to block all USA players. Fleyshman has stated that 1/3 of the Victory Poker players were residing in the United States. That number seems low to me, but he would know. It is public knowledge that Dan Fleyshman resides in Las Vegas, Nevada so you can’t blame the guy. And to think, right before April 15th (Black Friday), Dan was in meetings with the Cereus network (UB & Absolute Poker) to move Victory Poker to Cereus. Better luck next time, magic man. Victory Poker launched in Febraury 2010 on the small Everleaf Network. 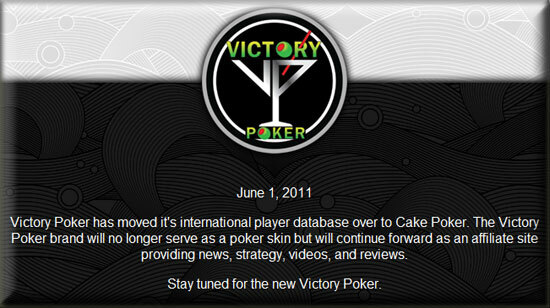 In September 2010 Victory Poker moved from the Everleaf network to the Cake Network. They just outgrew the small Everleaf network and by moving to Cake, there would be more opportunities to expand. At Victory Poker you can meet the members of Team Victory – Antonio Esfandiari, Keith Gipson, Brian Rast, Andrew Robl, Dan Bilzerian, Sara Underwood and David Chicotsky. They also had a team of some poker pros – Lee Markholt, Sander Lylloff, Paul Wasicka, Alec Torelli, Danny Wong, Steven Weusten and James Obst.